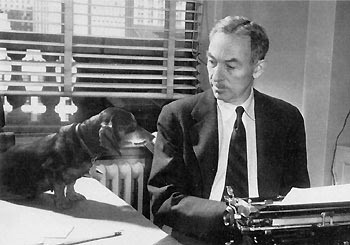 One of my favorite childhood writer is E.B. White. This past Christmas I bought all the kids on my list under the age of 10, the collection of White's most well-known children's works - Stuart Little, Charlotte's Web, and Trumpet of the Swan. I remember the stories as beautiful and gentle. They spoke of the natural world in a way that made me appreciate the suburban creatures around me even when I disliked them (think: big carpenter ants). I just came across this Paris Review interview with the author where he describes his proclivities for storytelling but not reading. "Delay is natural to a writer. He is like a surfer--- he bides his time, waits for the perfect wave on which to ride in. Delay is instinctive with him. He waits for the surge (of emotion? of strength? of courage?) that will carry him along." 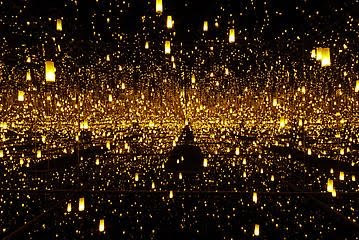 The best art exhibit I saw in 2009 was Yayoi Kusama's of Aftermath of Obliteration of Eternity at the Gagosian Gallery in NYC. The write-up from the gallery describes it most accurately which I've copied and pasted below, for an attempt at paraphrasing would not do the exhibit justice. In short, though, when I stepped into this box, I felt like I might have touched infinity. I just wanted to float away. If this work is ever exhibited again, I will make sure I get on line again, again, and again. I came across this link last week by accident...talk about a real-life romantic comedy/drama! Illustrator/artist Patrick Moberg sees a girl who captures his fancy on the train. 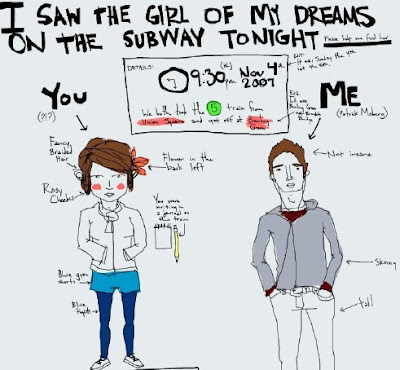 He goes home and applies his artistic skills to recreate the subway ride and find the love of his life. Gawker covered the ups and downs of the relationship. Although it sounds like it didn't work out in the end, I love the sheer honesty, forthrightness, and creativity. I've had Stylelikeu jotted down for a long time but it was only in the last month or so that I check it literally every day! It's a street style blog showcasing the style preferences of men and women via video interviews; most are just normal citizens but there are some entries with socialites or former models. 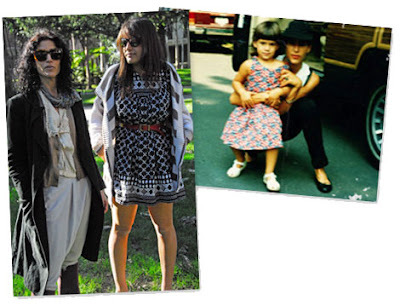 Elisa and Lily (photo above), the women behind the blog, are the exact people who you'd think could come up with a blog that takes "a deeper look into the thoughts and closets of people with inspiring style". Here are some of my favorites. Sophie Conti from Stylelikeu.com from Stylelikeu on Vimeo. Byrdie Bell from Stylelikeu.com from Stylelikeu on Vimeo. Frederique from Stylelikeu.com from Stylelikeu on Vimeo. No doubt, our current First Lady has a sense of her own style. Perhaps this "sense" has been a little exaggerated by fellow bloggers and press especially given her recent predecessors...it's not *that* hard to do better. 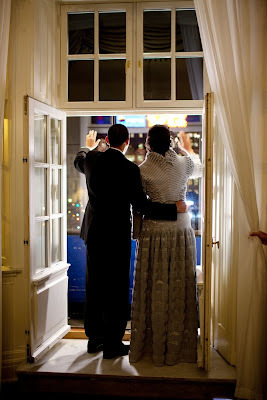 In any event, Mrs. Obama's dress in Oslo at her husband's awards dinner merits mention. Her Azzedine Alaia dress was both a bold and beautiful choice. Overall, I think she looks beautiful (although I think that the top portion of the dress isn't as well-fitting as it ought to be). But add the coat, and she really belongs on the ballroom floor. Checkout New York Magazine's compendium of Mrs. Obama's sartorial choices. I just learned about designer Caterina Gatta from the new, elegant consignment shop Change of Season in NYC's East Village. She uses vintage fabric from haute couture designers like Versace and Givenchy to create new pieces. Think Some Odd Rubies but with fabrics that have graced the hallways of the finest French and Italian fashion houses. Gatta's work will be on sale at Change of Seasons. Swing by on December 11th for the trunk show, 7PM-9PM. See invitation below.